Submission deadline expired on March 15th, 2018. 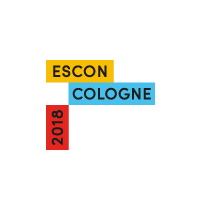 Please contact us via escon-2018 uni-koeln.de if you have questions regarding submissions/ contributions. The European Social Cognition Network is a training network for PhD students in Social Cognition. The network's mission is to train and guide PhD students. As such, we highly encouraged PhD students to submit at any stage of their project (from the early stage of a project, where exploratory work is conducted, to the final stage of a project, where confirmatory work is conducted). Nevertheless, researchers at all career levels could apply. Papers are to report empirical or theoretical contributions in social cognition. In an abstract of up to 500 words, provide an outline of the research question, its theoretical background, the method used for investigation, and the results. Applicants for the Best Paper Award need to submit an extended abstract of about 800 words. Please consult the Best Paper Award section for more information. Please make sure that the steering committee can recognize the scientific contribution of your talk from the abstract alone. Decisions about contributions will be sent out timely, exact date yet to be announced.